Many workers are unaware of chemicals that create potential hazards in their work environment, making themselves and others more vulnerable to exposure and injury. The purpose of paint booths is to control the environmental conditions while spraying the paint. 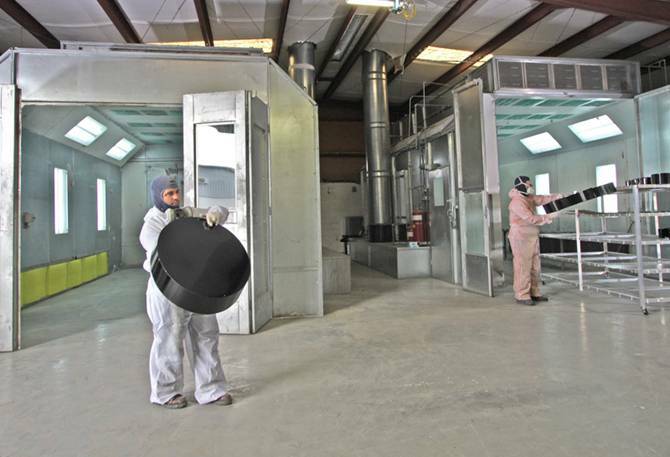 Paint booths use exhaust fans and specialized ventilation systems to remove the fumes after strong paints are applied, preventing anyone from inhaling them and becoming ill. Occupational Safety and Health Administration (OSHA), currently regulates exposure to approximately 400 substances. Hazardous and toxic substances are defined as those chemicals present in the workplace which are capable of causing harm. In this definition, the term chemicals include dusts, mixtures, and common materials such as paints, fuels, and solvents. In a workshop environment, it can often take hours for overspray to clear. This increases the risk of breathing in harmful materials for other workers and increases the level of Volatile Organic Compound (VOC’s) emissions, which is harmful to human health and vegetation when present at high enough concentrations. This presents a significant risk to the surrounding environment. The exhaust system in paint booths reduces the amount of volatile organic compounds that are released into the atmosphere. Once a coat of paint has been applied, workers can usually return to the paint booth without respiratory equipment within three minutes. For this reason paint booths serve a great deal of responsibility by keeping you and others safe from illnesses that could be long-term or fatal.